The government has been defeated again today, following another historic defeat last night, as MPs passed an amendment tabled by Tory backbencher Dominic Grieve by 308 votes to 297. Commenting on the amendment passing, Labour’s Brexit spokesperson Keir Starmer said: “The government’s decision to delay the meaningful vote has run down the clock and increased the risk of a no deal Brexit. The Grieve amendment, which was approved by the Commons with a majority of 11, aims to force the Prime Minister to return to the House with an alternative plan by Monday 21st January after her deal is voted down on Tuesday. Without the amendment, the government would have had to make a statement on the next steps for Brexit within 21 days, then allow a Commons vote within seven sitting days. Thanks to another Grieve amendment passed before the Christmas recess, the ‘Plan B’ motion will be amendable. This enables MPs, including the opposition, to propose their own alternative Brexit plans, such as the membership of a customs union favoured by Labour. 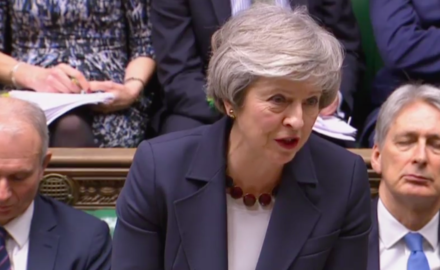 If Theresa May’s deal is voted down as anticipated on Tuesday, it has now been determined that she will have six calendar days to secure reassurances from the EU ahead of another vote. 238 Labour MPs voted in favour of the move today, while just one – Sir Kevin Barron – voted against, plus Frank Field who now sits as an Independent. 17 Tories went against the government to back the amendment. Speaker Bercow’s decision to select the Grieve amendment this afternoon – despite it changing a business motion normally expected to be amendable by government only – was controversial. For over an hour, following PMQs this afternoon, the Speaker took points of order on his ruling. A number of Tory MPs accused Bercow, who is thought to be a Remainer, of bias and of undermining the “integrity” of his position as Commons Speaker. Many members on the opposition benches spoke up to support Bercow, and it is widely understood that Labour’s backing of the Speaker protects him from being ousted by MPs.